At Eventseeker, we’re always looking for new ways to bring music to the masses. Our latest effort is the most exciting yet! We recently announced the new *Eventseeker Presents* show series, and this inaugural lineup is one for the books. 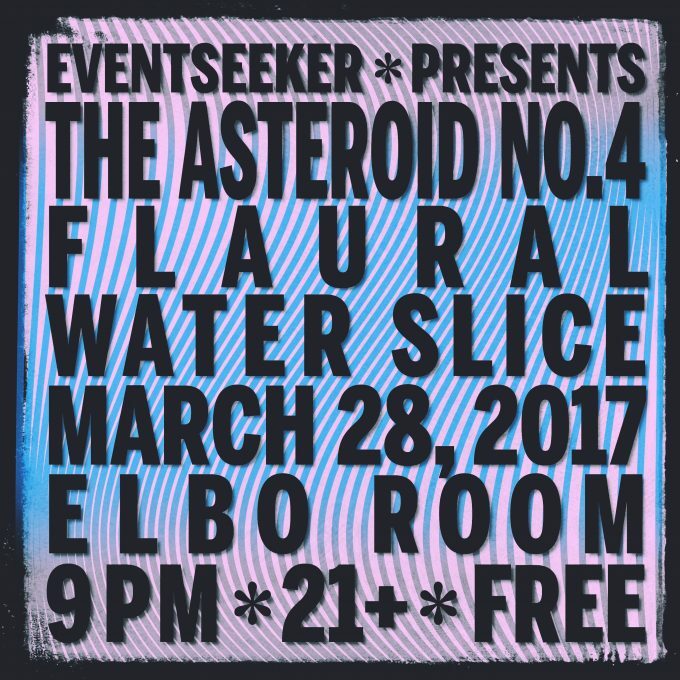 Asteroid #4, Flaural, and Water Slice will be marking this momentous occasion with a mix of psychedelia, experimental pop and post punk. March 28 is the day! Elbo Room on Valencia Street is the place. And this one’s on us — FREE SHOW! WHAT: Eventseeker Presents monthly show series! Please note, this is a 21+ show. No one under 21 will be allowed inside. The Asteroid #4 is a psychedelic band that emerged out of Philadelphia in the late 1990s. Taking the infectious elements of The British Invasion and blending it into a kaleidoscope of Eastern influences, the band mastered its own brand of psychedelic rock and experimental pop and earned a devout following across the US and in niche psych communities around the world. Led by vocalist and guitarist Scott Vitt, The Asteroid #4 continues to push the classic stylings of the 1960s into new realms. Flaural is a band from Denver that brings a new wave psychedelia to pop music. Composed of Colin Johnson, Noah Pfaff, Nick Berlin and Connor Birch, the band emerged in 2015 and established itself with the debut single “Nonnie,” a groovy take on shoegaze that captures the band’s signature shimmery guitars. With its 2016 debut EP Over Imaginary Cigarettes, and a strict touring regime, Flaural continues to reach legions of neo-psych fans across the US. Water Slice is the project of Pacific Northwest native and Los Angeles-based artist Patrick Philips. Blending post punk elements into a foundation of experimental pop, the band solidified in 2016 and quickly released its debut single “Our Hearts Don’t” later the same year. The track, a groovy and introspective take on growing older, is anchored by playful basslines and lyrics that invite listeners into each pull of regret and acceptance.